Pros: Adamsdale extracts great comedy value from his interactions with the audience. Cons: The audience participation is not unkind, but if you’re nervous then sit well back. A clever, funny send-up with a warm heart! 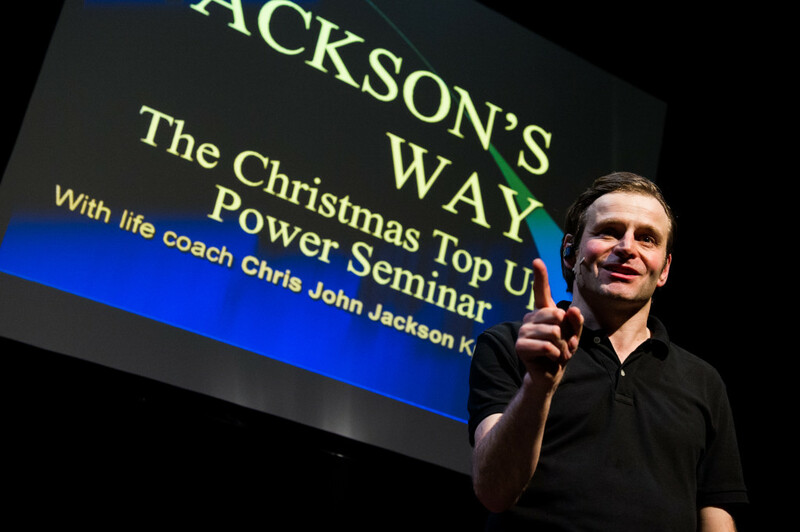 Jackson’s Way is the life coaching method developed by motivational speaker Chris John Jackson. At its heart is the ‘Jaction’: a pointless action that gains a kind of meaning through repetition. Advanced students can progress to the ‘Compound Jaction’, in which multiple complex and improbable actions are performed in sequence. Will Adamsdale, Jackson’s alter-ego, has most definitely reached the compound stage. His one man, one hour show is a masterclass in multi-tasking, which sees him delivering his spiel, interacting with the audience at high speed, counting references to Christmas and managing Erik, his Production Manager. It is chaotically slick. The show starts with an almost empty stage, a large projector screen and the voice of Jackson bigging himself up over the PA. 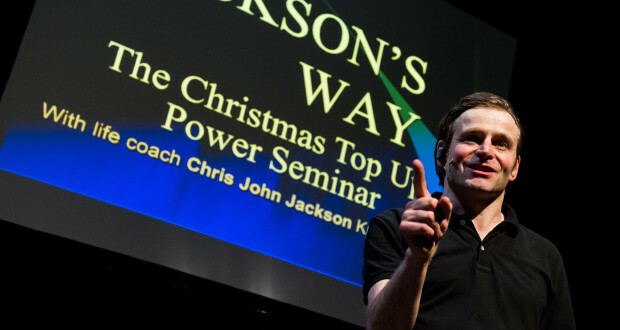 When he finally jogs onto the stage, dressed in a sports casual kind of way, he plugs his books for a while before explaining the genesis of Jackson’s Way. This exposition involves a number of nonsensical slides and is delivered with the straight-faced zeal familiar to any watcher of TV evangelists. 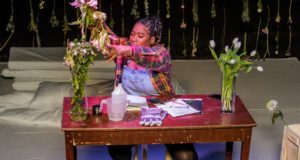 Audience members are coached to perform their own Jactions, and spurred on with air-punching, motivational phrases and acronyms. It is very funny and, as a straightforward parody of the life improvement industry, very effective. But gradually the tone changes, and cracks start to appear in Jackson’s brash façade. There is a running joke about BAC wanting a Christmas show and Jackson wanting to deliver his usual coaching session. Finally bowing to pressure, he tells an off-kilter version of the Nativity story, using junk from his collection to represent the characters. 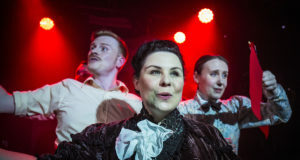 There’s really no need, because the spirit of panto is alive and well in this show, with its catchphrases, motifs and gentle sending up of audience members. But there is also a lot of uncomfortable truth. The philosophy behind Jackson’s Way – that people should make a virtue of doing meaningless stuff because there is so much more of it in life than there is meaningful stuff – is patently absurd and yet strangely appealing. A person who describes a collection of inanimate objects as his ‘team’ is clearly worthy of derision, but then which of us doesn’t take comfort from the things – often worthless to an outsider’s eye – that we live with or cart around with us? A tragicomic hero with shades of Alan Partridge but a great deal more self-awareness, Chris John Jackson is a very likeable fool. And Will Adamsdale’s show is both hilarious and instructive; as I clean out the hamster cage for the nth time, I shall remind myself to PTI – push through with intensity!